Posted March 27, 2019 by Suneel Kumar & filed under Software. 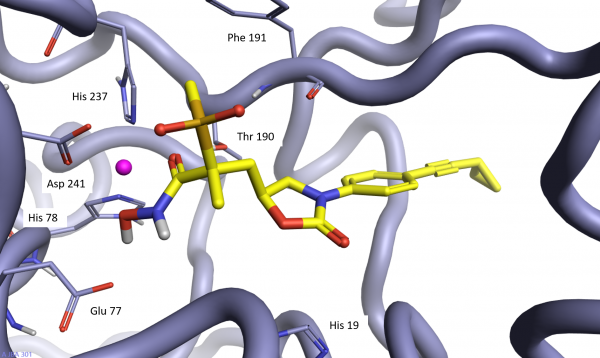 Novartis Institutes for Biomedical Research recently published the paper Application of Virtual Screening to the Identification of New LpxC Inhibitor Chemotypes, Oxazolidinone and Isoxazoline. They report using Spark™, Cresset’s scaffold hopping application, to find core replacements for the indazole moiety of compound 6 in Figure 1. 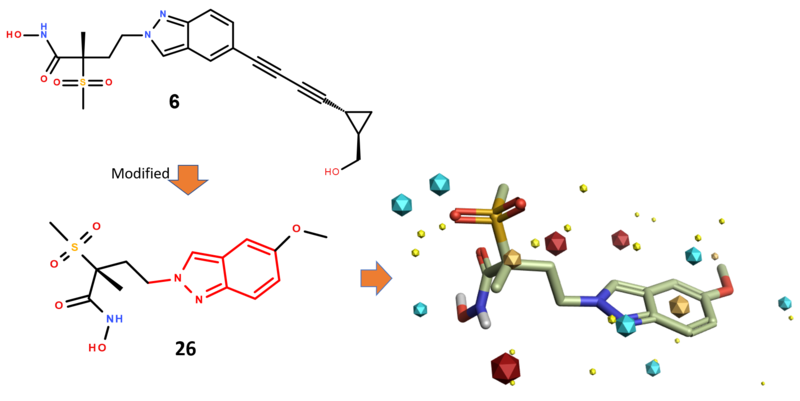 Visual selection of the most promising top-ranking Spark results and further optimization studies led to the identification of novel LpxC inhibitors with subnanomolar binding to LpxC and in vivo antibacterial activity against P. aeruginosa and other Gram-negative bacteria. The bioactive conformation of compound 26, a simplified version of compound 6 originally reported by Actelion, was used as the starter molecule for the Spark scaffold hopping experiment. Aim of the search was to identify appropriate replacements of the indazole core (Figure 1). Figure 1. Top: LpxC inhibitor 6. Bottom: The bioactive conformation of compound 26 was used as the starter molecule for the scaffold hopping experiment with Spark. The allowed atom types for the ‘linker 1 atom’ and ‘atom 2’ (see Figure 2) were set respectively to ‘any carbon atom’ and ‘any atom’. It was further specified that all Spark designs must contain at least 1 ring and should not include any reactive functionalities. The Spark experiment was performed on fragment databases derived from ZINC,1 ChEMBL,2 and the VEHICLe3 collection of theoretical ring systems. The similarity score of the Spark results towards compound 26 was calculated using 50% field and 50% shape similarity. The 100 top ranking clusters were manually reviewed with respect to synthetic feasibility, introduction of hydrophilic groups in the area of the indazole moiety and calculated physicochemical properties. Figure 2. Allowed atom types for ‘linker 1 atom’ and ‘atom 2’ in the Spark experiment. 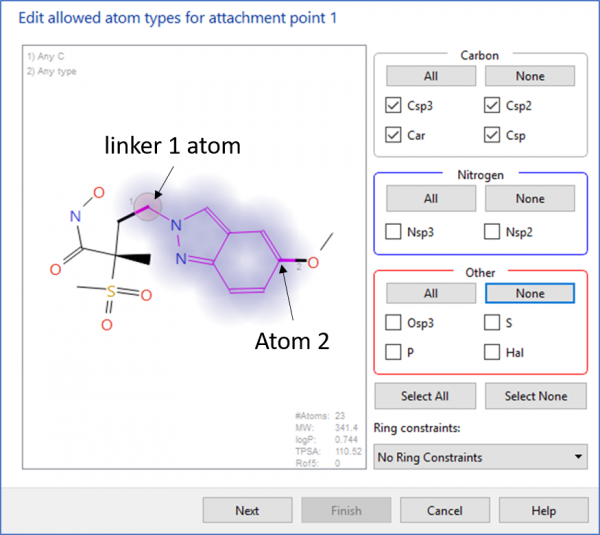 The oxazolidinone 13 and isoxazoline 25 scaffolds were shortlisted among several proposals which link ‘linker 1 atom’ and ‘atom 2’ with an hydrophilic linker (Figure 3). 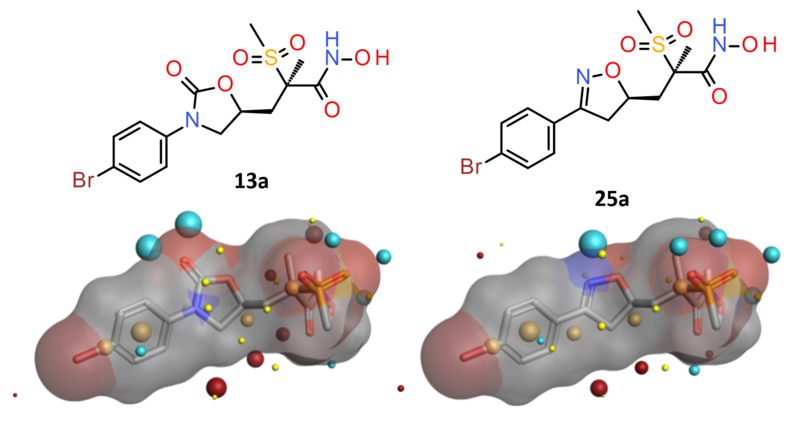 Analogues of 13 and 25, where the methoxy group in para position was replaced by a bromine atom (Figure 3) showed cellular activity with Minimal Inhibitory Concentrations (MIC) values below 4 μg/mL against P. aeruginosa. Accordingly, these series were selected for further investigation. Figure 3. Oxazolidinone 13a and isoxazoline 25a showed MIC <4 μg/mL against P. aeruginosa. Further investigation and expansion of both oxazolidinone and isoxazoline series led to the identification of compounds with potent in vitro activity against P. aeruginosa and other Gram-negative bacteria. Representative compound 13f (Figure 4) demonstrated excellent efficacy against P. aeruginosa in an in vivo mouse neutropenic thigh infection model. The crystal structure of 13f complexed with the P. aeruginosa LpxC enzyme (PDB: 6MAE) shows that the hydroxamic acid moiety is bound to the zinc atom in the active site, and involved in interactions with H78, H237, T190, E77, and D241 (Figure 4). The hydrophobic tail (phenyl group) interacts with several hydrophobic side chains, and the cyclopropyl group further extends to the solvent exposed region. The sulfone oxygen atoms interacts with well-defined crystallographic water molecules (not shown in Figure 4), and the methyl group attached to the sulfone functionality is engaged in hydrophobic interactions with F191. The carbonyl oxygen of the oxazolidinone forms a favorable polar interaction with the C2 CH group of H19. 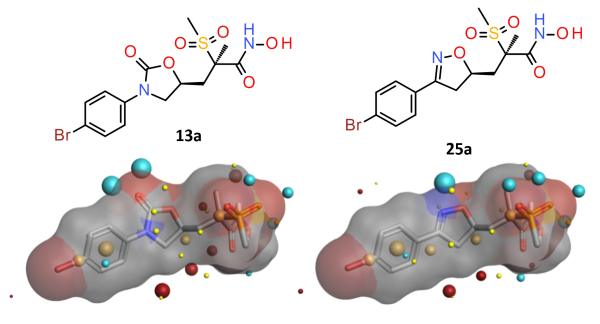 The crystal structure of 13f thus confirms that the oxazolidinone group can favourably orient the sulfone/hydroxamic acid portion of the inhibitor with respect to the hydrophobic phenyl group while maintaining a low-energy conformation, as predicted by Spark. This paper from NIBR shows that Spark can guide the rational design and discovery of new drug candidates. In this case, a traditional scaffold hopping experiment led to the identification of novel oxazolidinone and isoxazoline LpxC inhibitors with potent antibacterial activity against Gram-negative bacteria. Request a free evaluation of Spark to move to new series and non-obvious IP by swapping scaffolds. Irwin, J. J.; Sterling, T.; Mysinger, M. M.; Bolstad, E. S.; Coleman, R. G. ZINC: A Free Tool to Discover Chemistry for Biology. J. Chem. Inf. Model. 2012, 52 (7), 1757–1768. Gaulton, A.; Bellis, L. J.; Bento, A. P.; Chambers, J.; Davies, M.; Hersey, A.; Light, Y.; McGlinchey, S.; Michalovich, D.; Al-Lazikani, B.; Overington, J. P. ChEMBL: A Large- Scale Bioactivity Database for Drug Discovery. Nucleic Acids Res. 2012, 40 (D1), D1100–D1107.